Sorry.. bad pun, I know. It’s true, though. Knit happens when you least expect it. I haven’t been doing much knitting lately at all. John’s slippers still aren’t done. However, while perusing through patterns on Ravelry, I came across one that I thought I had the perfect yarn for. Turns out I was right. The yarn is King Cole Soft as Silk, 100% acrylic. The pattern is Baby’s Car Seat Blanket. Whether this remains car seat blanket sized or wrap sized remains to be seen. As written, I’m already one quarter of the way through the knitting. 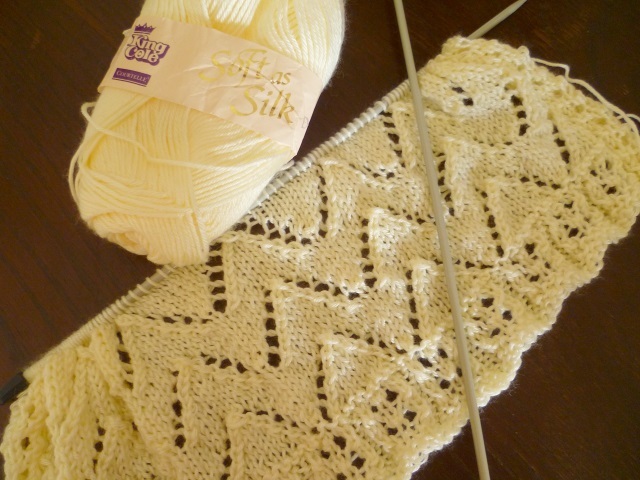 The lace pattern is an easy one to read and to remember. The yarn is a joy to work with. I don’t usually like acrylic but this one lives up to the name, soft as silk. It’s also knitting up very quickly as it’s worked on 4.5 mm needles. Unfortunately, there won’t be much knitting time today. I’ll be picking up the grandkids and a few tomato plants (not necessarily in that order) today. The plan is to do a bit of gardening, tidy up some of the beds, plant a couple of tomato plants along the driveway, plant some garlic in pots, and then to roll out, roll up, and bake the croissants that have been resting in the fridge since yesterday. It will be a busy but productive day.